At the same time as the European football championship of UEFA, the EURO 2012 in Poland and in Ukraine, from 16-24 June 2012 the championship of the autochthonous, national minorities of Europe took place at the Lusatian Sorbs in Germany. Our language diversity team was there during the whole week. The organisers of the EUROPEADA 2012 were the Federal Union of European Nationalities (FUEN) and Domowina – the Federation of Lusatian Sorbs. The EUROPEADA 2012 took place under the patronage of the Prime Minister of the Free State of Saxony Stanisław Tillich, who is a Lusatian Sorb himself. 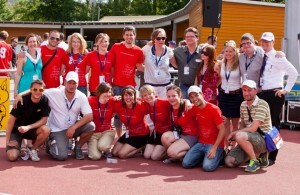 19 Teams from 12 European countries competed for the first place at the EUROPEADA 2012. Next to the hosts, the national team of the Lusatian Sorbs, they included the defending champions, the selection of South Tyrol; the Cimbrians – a very small German enclave; the Occitans, which is a regional language community of several millions from France; national minorities such as the Danes in Germany and minorities without a kin-state such as Ladins, Rhaeto-Romansh and Karachay. The EUROPEADA 2012 as a European sports-event contributed to demonstrating the contribution of the autochthonous, national minorities and the regional and minority languages to linguistic and cultural diversity and to showing their unique influence on the European regions. With the help of the Youth of European Nationalities, the language diversity team used the event for several small campaigns on multilingualism and linguistic diversity. During the football matches short films were recorded, goodies were disseminated, the matches were commented in several different languages, and promotion actions, flashmobs and interviews took place. Next to football, our team focused in particular on youth and children. We visited Sorbian schools to introduce the school pupils in a playful way to the subject of multilingualism and linguistic diversity. Over the week the whole region got to know us, we spoke with many people and established contacts and friendships.